Chop the carrot and beetroot into small equal size peices and steam for about 15-20 minutes until cooked. Drain and leave to cool. Once the vegetables are cool add to a food processor with all the other ingredients and blend until smooth. Adjust salt and pepper seasoning to taste. Lovely with crudites or flat breads or used as a sauce in sandwiches. Note: You can use a purple carrot to preserve the bright pink colour. 29 members have added this recipe to their cookbook. 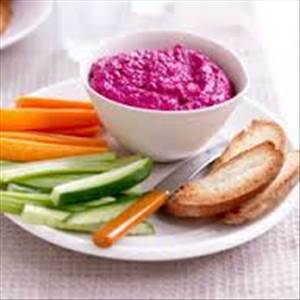 There are 36 calories in 1 serving of Beetroot & Carrot Dip. Calorie Breakdown: 43% fat, 43% carbs, 14% prot.